One God! None other than God! One God. Why would you not believe? One day you will stop believing that you have all the power to do……Insha’Allah. One God. None other than God. One God. The day, the signs will be overwhelming. The day, there will be no return. The day, we will all be brought together. The day there are only two destinations. The day many will cry out in despair. The day many will end up in fire. This entry was tagged islam. Bookmark the permalink. 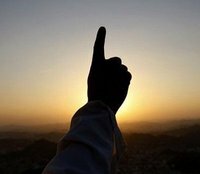 ← Ramadan Reminders: Du’a is the Sunnah!